Neem (Azadirachta indica syn. Melia azadirachta, M. indica) other names: Antelaea azadirachta, Arishta, Arishtha, Azadirachta indica, Bead Tree, Holy Tree, Huile de Neem, Indian Lilac, Indian Neem, Lilas des Indes, Lilas de Perse, Margosa, Margosa Tree, Margousier, Margousier à Feuilles de Frêne, Margousier d’Inde, Melia azadirachta, Neem Oil, Neem Tree, Melia azadirachta, Nim, Nimb, Nimba, Persian Lilac, Pride of China. The neem tree is found growing in abundance in woody areas and in lowland tropical areas in Sri Lanka and in India, where neem is native, and today this useful tree is also naturalized in several other tropical regions of the world, including Indonesia, West Africa and Australia. The bark, leaves, and seeds are used to make medicine. Less frequently, the root, flower, and fruit are also used. The neem is a tree in the mahogany family Meliaceae. Neem is one of the two species of the genus Azadirachta. 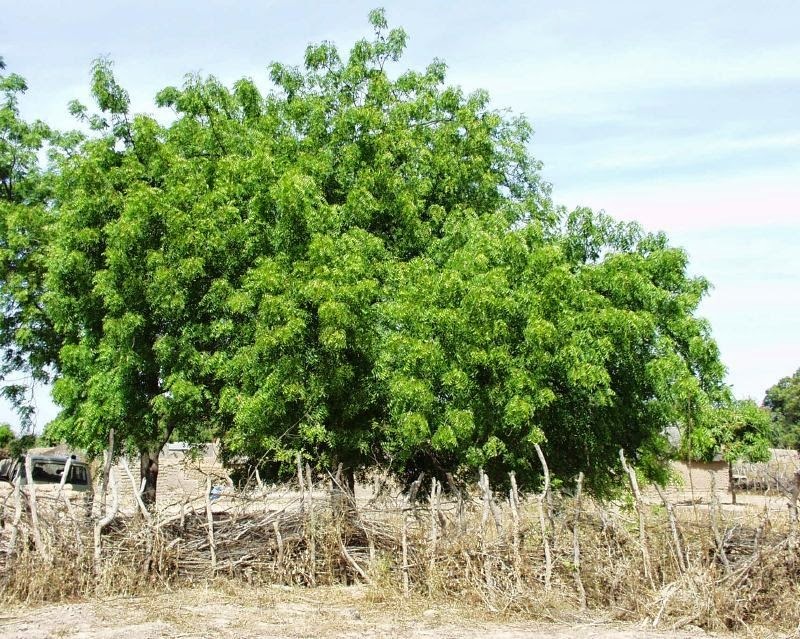 Neem is a fast growing tree, and the neem tree can quickly reach a height of 15-20 m, and at times can even grow up to a height of 35-40 m. An evergreen tree, the neem is capable of surviving severe drought conditions, wherein neem can shed some or all of its leaves and still flourish. A tree with widespread branches, the neem has a dense oval or round crown. The neem has a short and relatively thick trunk, of about 1.2m diameter, and the bark may be fissured and roughly textured, reddish brown or whitish gray in color. The sapwood of neem tree may be grayish white, the heartwood reddish when they are initially exposed to air, after which they may turn reddish brown in color. The root system of the neem is comprised of a strong taproot, and excellently developed lateral roots. The pinnate leaves of the neem are alternating, and they can be about 20 to 40 cm long, with about 20 to 30 dark green to medium green leaflets about 3 to 8 cm in length. The leaves when they are very young can be purplish or reddish in color. More often than not, the terminal leaf is found to be missing, and the petioles are found to be very short. The mature leaflets are often asymmetric, and their margins are dentate, except for the base of their basis copal half, which is very strongly cuneate and reduced. 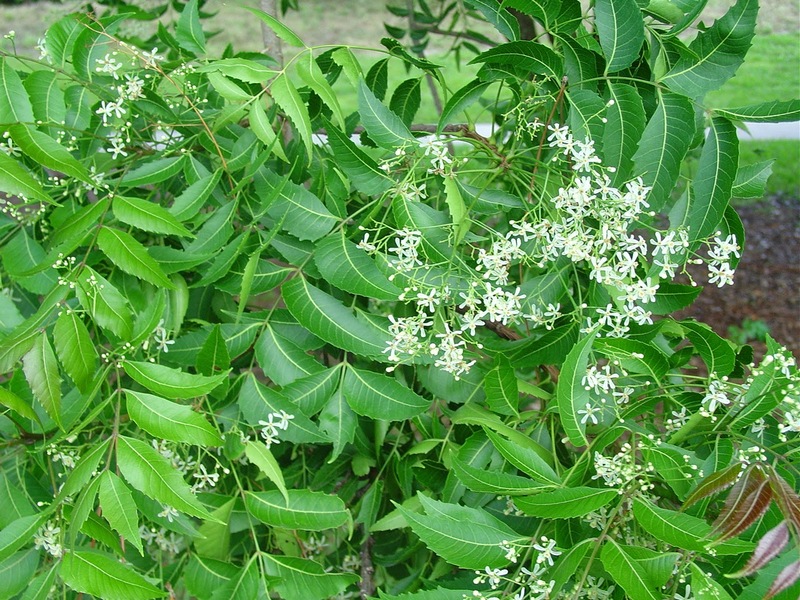 The flowers of the neem tree are small, white and fragrant. They are arranged in an axillary manner, and consist of more or less drooping pinnacles almost 25cm in length. The inflorescences bear about 150 to 250 flowers and one single flower maybe anywhere from 5-6 mm long and 8-11 mm wide. The neem is a polygamous tree, with protandrous, bisexual flowers as well as male flowers growing on the same individual. The fruit of the neem tree can be described as a glabrous olive-like drupe, which can be either an elongated oval in shape, or completely rounded. The fruit when completely ripe can be about 1.4-2.8 x 1.0-1.5 cm in size and the skin of the neem fruit or in other words the exocarp is thin and delicate. The bitter-sweet pulp or the mesocarp, which can be about 0.3-0.5 cm thick, is yellowish-white and very fibrous. The endocarp or the white hard inner shell of the fruit normally encloses about one, or at time two, or even three elongated seeds that are encased in a hard outer shell or kernel which sports a brown color seed coat. The bark is used for malaria, stomach and intestinal ulcers, skin diseases, pain, and fever. While the decoction of the bitter bark that has astringent properties can be used for the treatment of hemorrhoids. The flower is used for reducing bile, controlling phlegm, and treating intestinal worms. The fruit is used for hemorrhoids, intestinal worms, urinary tract disorders, bloody nose, phlegm, eye disorders, diabetes, wounds, and leprosy. The seed and seed oil are used for leprosy and intestinal worms. They are also used for birth control and to cause abortions. The neem oil can be used as a sort of anti-viral and anti-fungal hair dressing. This dressing is also known to prevent and get rid of lice and other infestations of the scalp. Neem is possibly safe for most adults when taken by mouth for up to 10 weeks, when applied inside the mouth for up to 6 weeks, or when applied to the skin for up to 2 weeks. When neem is taken in large doses or for long periods of time, neem is possibly safe. 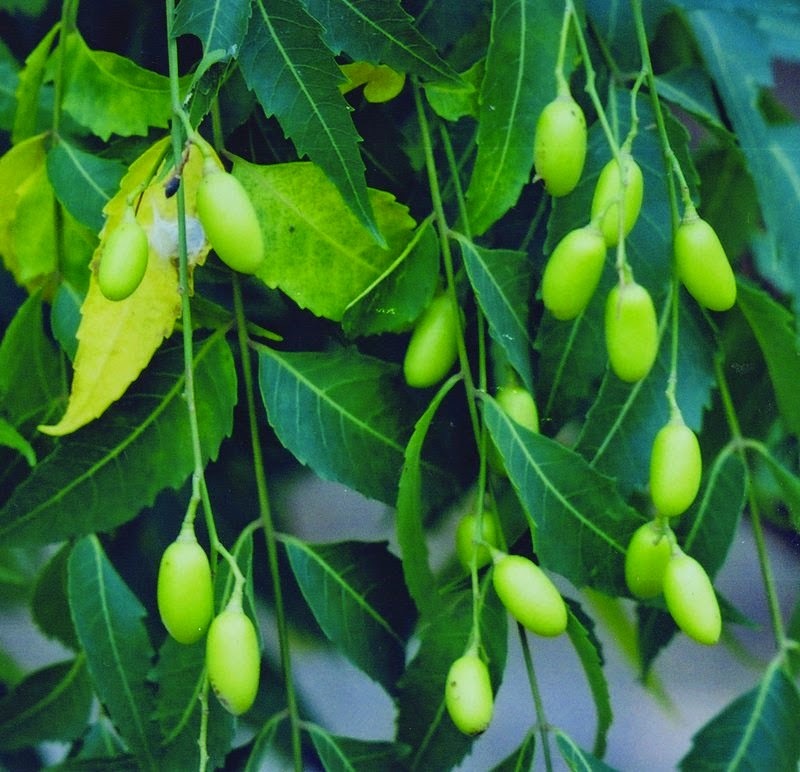 Neem might harm the kidneys and liver. Pregnancy and breast-feeding: Neem oil and neem bark are likely unsafe when taken by mouth during pregnancy. They can cause a miscarriage. Not enough is known about the safety of need during breast-feeding. Stay on the safe side and avoid use. Reduced ability to have children (infertility): There is some evidence that neem can harm sperm. Neem might also reduce fertility in other ways. If you are trying to have children, avoid using neem.